The Crows have not adapted the way they play ahead of their first match at the Adelaide Oval. “We are lucky the Unley Oval in West Adelaide is pretty much the same size as Adelaide Oval, so we have been training on that all year,” Considine said. So it’s kind of not going to have any bearing on us because we’re used to it. Considine does not know if she will be playing deep forward again like last round where she scored two goals. “I’d love to be anywhere on the field, as that’s where I am at really at my playing career just to be on the field is a bonus for me,” Considine said. Considine was modest when asked who she thinks from Geelong will be lining up on her. 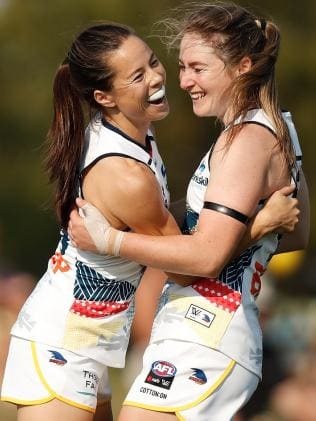 “Geelong will be more worried about Stevie-Lee because she is on a goal fest scoring goals,” Considine said. “I don’t think they will be thinking about me to be honest if I am there or not. “I’m actually not sure who will be lining up on me, but they will definitely be focusing on Stevie, because she’s in great form and Erin obviously as well because they are playing so well. Meanwhile, as Considine has played the game for a short time this helps her. “Yes that’s probably a good thing for me I guess, as there’s only the six games from the round games of footage of me,” Considine said. “So its definitely something that is in my advantage for opposition teams, because I am still learning the game and obviously from the six games my skills would vary because I am still learning. The Crows have not done too much video study on the Cat’s players as a whole but more on the players individually. “We have done a little bit, not too much,” Considine said. “We have done more on individual, general game plan and how they play and just how we can work around that. “We don’t ever do too much, because we try to focus on our own game as much as possible. “We look at them performing in terms of their stats in the league – what they are doing well in and areas we feel we can catch them off guard and do slightly better.” Considine says the Adelaide crowd has supported the Crows ladies. “The Adelaide crowd has been amazing,” Considine said. “Even on my first home game in Adelaide, the atmosphere and crowd was amazing, around 7,000 or 8,000 there. “Even the last home game in Unley Oval, the atmosphere against GWS was just something special to see the amount of people there cheering you on and cheering on the team. This week, the Adelaide crowd has truly embraced the girls. “Yes definitely this week we’re into the prelims the business end of the season and everyone is coming up to you and wishing you luck,” Considine said. Considine is yet to experience wet weather football in the AFLW. “I haven’t here to be honest and haven’t had a training session here,” Considine said. “Not in Adelaide I have not had an experience with wet weather. “When I was in Darwin obviously with the humidity the ball was a little bit wetter, so for our pre-season game it was quite wet that day and that was the only experience I have really had at this level. “Back home obviously the weather in Ireland is not always as pretty as here, so we do get a lot more rain, so when we are playing our tournaments back home we experienced the rain. “At this level I have not had much experience in the rain, so I’m hoping its dry this weekend. The following and support in Ireland has grown and the Irish girls have bonded from all AFLW teams. “Social media has made that definitely easier for them to follow us as well, because of the time difference its quite difficult to watch the games and follow it all the time,” Considine said. “The support from home has been great and from the girls playing over here and was lucky to meet all of the girls after playing them. “After the GWS game I got to meet Yvonne and Cora, after we played Bulldogs I got to meet Aish and of course we didn’t play Collingwood, so unfortunately I didn’t get to meet Sarah Rowe. “We are always looking after each other and wishing each other good luck for the games. Considine has experienced finals once at home playing Gaelic football, which is the equivalent of the Grand Final in Melbourne and the All Ireland final. “It’s done in a big stadium as well,” Considine said. “So it was quite a crowd in a big stadium, big pitch and that will definitely help me for the coming game. “Big stadium that is Adelaide Oval and big pitch, so I am lucky that I have had some experience in that even though it’s a different sport and a sport I played in for 20 years." Considine is looking forward to playing on the big stage at the top women’s football level. “Just getting the chance to go out there on such an amazing stage and getting to play alongside the girls that have become your family and friends,” Considine said. “You can’t beat that and we have done so much throughout the year and come to this. “At the end of the day you want to win with these girls and you want to do as much as you can on the biggest stage and (on) the biggest oval in Adelaide is something special.